Jeffrey Johnson descending in to crater. Camp is visible on a terrace 700 feet below. He’s studied volcanoes in Chile and Guatemala. Now this Boise State University volcanologist is studying a lava lake in central Africa, hoping it can help scientists better understand when volcanoes are going to erupt. Jeffrey Johnson lives here in Idaho, which is surrounded on both east and west sides by volcanic activity. Working in a geographic range between Mt. St. Helens and Yellowstone National Park, Johnson says it's crucial to learn the language of volcanoes, to better understand when they’ll erupt. To that end, he’s been listening to lava in a volcano in the Democratic Republic of Congo. Detail of a portion of the lava lake, which is 900 feet in diameter. With funding from the BBC, Johnson and his colleagues dropped inside the volcano’s crater to study a lake of lava bigger than Bronco Stadium. Johnson “listens” to volcanoes with specialized monitors, to try to predict when they’ll change their activity, which can lead to an eruption. 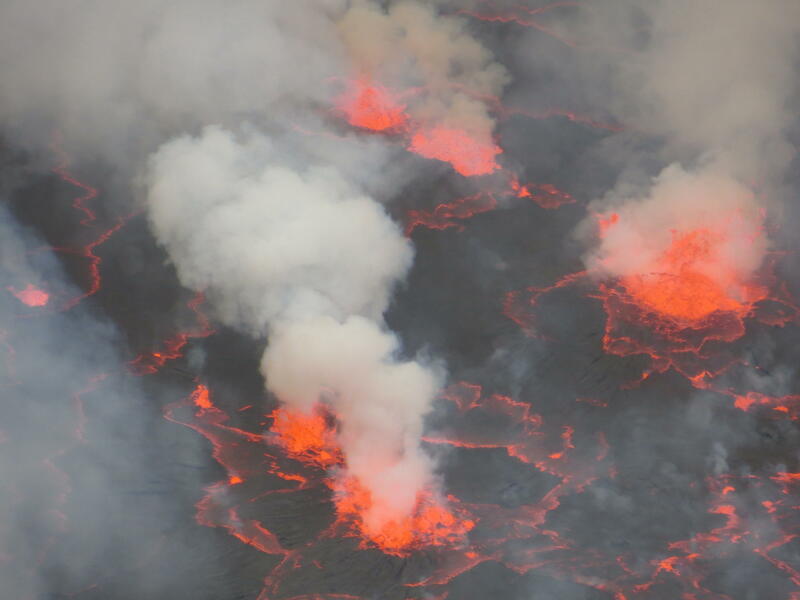 Johnson just got back from a three-week field trip to the lava lake inside Nyiragongo. He said it was a complicated journey. It's a mile-high climb to the 11,000 foot summit and it took 500 porter loads to get the gear they needed to the volcano. Johnson left sensors behind in Africa, which continue to “listen” to the volcano and feed information to him back home in Boise. He hopes research like his will not only help the people who live around that volcano, but residents who live around Mt. Rainier, Mt. St. Helens and other volcanoes in the Northwest. Johnson says his three-week field trip was sponsored by the BBC but much of his funding for his research comes from National Science Foundation grants at Boise State. There’s a volcano in Guatemala that erupts on a regular basis, so regular that some scientists call it the “Old Faithful” of volcanoes. That makes it very popular with people who study volcanoes, like Boise State Professor Jeffrey Johnson. Thanks to a grant from the National Science Foundation, Johnson recently led 60 researchers from Mexico, France, Italy and the United Kingdom to conduct different studies on the volcano. He returned last month and says the work being done in Guatemala could someday help scientists better predict how other volcanoes will behave. Jeffrey Johnson got quite a wakeup call this week. The assistant professor of geosciences at Boise State University is working in Pucon, Chile on a Fulbright grant to study volcanoes. He was just ten miles away when the Villarrica volcano had a large eruption Tuesday morning. Scientists monitoring Mount St. Helens confirmed Wednesday that magma is on the rise and "re-pressurizing" the volcano in southwest Washington. A new study shows the chamber of hot molten rock below Yellowstone National Park is more than 2 and a-half times larger than previously estimated. Lead author Jamie Farrell of the University of Utah said Monday the magma chamber is about 55 miles long, 18 miles wide and runs at depths from 3 to 9 miles below the earth. That means the supervolcano below Yellowstone has the potential to erupt with the force of its largest-ever eruption 2.1 million years ago.